Why does my license show an expiration date? I thought FusionInvoice was buy once, use forever? Why can't I change my invoice status to Paid? Why aren't my recurring invoices working? I forgot my password - how can I reset it? Why do the totals on my dashboard all show zero? Can FusionInvoice work with XYZ payment gateway? How can I remove index.php from my URL? How can I force my FusionInvoice installation to be served over https? You're right - it is, and it always will be! Renewing your support period is completely optional. FusionInvoice will never stop working simply because your support period has expired. Renewing your support period gives you access to another full year of support and program updates (every update, including major version releases). Why can't I change the status to paid? The paid status is the only status you cannot manually change an invoice to. To change an invoice to Paid status, the invoice must have a payment made in full. Once the invoice has no remaining balance, the status will automatically update to Paid. First, check the Next Date of the recurring invoice you expect should have generated. The date in the Next Date field indicates the date which this invoice should recur next. If this date is in the future, then the invoice isn't ready to recur yet. If the Next Date is today's date or prior to today's date but the recurring invoice hasn't been generated, then the next step would be to visit http://YourFusionInvoiceURL/tasks/run (or http://YourFusionInvoiceURL/index.php/tasks/run if you have to specify index.php in your URL). You'll be greeted by an empty, white page. This is good - if you go back to check your list of recurring invoices, you should find that the Next Date has incremented to the next date in the set frequency. You should also find that the new invoice has appeared in your list of invoices. If this is the case. then the Task Scheduler cron job hasn't been set up or has been set up improperly. You'll be greeted with a lovely, "Whoops..." error message. If this is the case, there will be details logged at the bottom of your storage/logs/laravel.log file. If you are unable to determine the cause of the problem after reviewing the file, email a copy of the log file to support@fusioninvoice.com along with a description of the problem you're having. Download the Reset Password utility. Upload the unzipped ResetPassword folder to the app/Modules folder on your server so that it becomes app/Modules/ResetPassword. Visit your FusionInvoiceURL/resetpassword to reset your password. Once your password has been reset, delete the app/Modules/ResetPassword folder from your server. 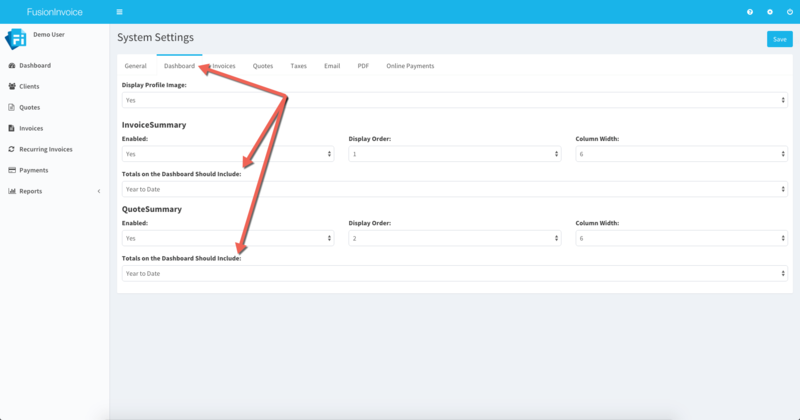 There are settings on the Dashboard tab of System Settings which control this behavior for both quotes and invoices. The default option is Year to Date. This can be changed to This Quarter, All Time, or Custom Date Range. FusionInvoice uses the Omnipay payment processing library which supports a large number of different payment gateways. Even though Omnipay supports a large number of gateways, FusionInvoice implements support for those gateways upon popular request. If a gateway is on the list of Omnipay supported gateways that isn't yet implemented in FusionInvoice, please don't hesitate to ask! However, if Omnipay does not support a particular gateway, then FusionInvoice will not support it either. Verify that the .htaccess file distributed in the FusionInvoice download file was actually uploaded to your server. This file should exist in the root folder of your FusionInvoice installation (in the same folder as the index.php file). This file should work out of the box 99% of the time for Apache environments. Make sure the Apache mod_rewrite module is installed and enabled. If you are unsure of how to check for this, contact your web host support or system administrator to ask them. Use this guide to import the include mod_rewrite rules from the .htaccess file into a web.config file for IIS. Version 2018-4 added an option to the General tab of System Settings which will force FusionInvoice to be served over https. Prior to enabling this option, be sure your FusionInvoice installation is functional via https. Failure to do so may result in a non-functional (but fixable) installation. It is recommended that your server environment be configured to redirect incoming requests from http to https, but if this is not an option, you may enable the Force HTTPS option in System Settings.